We would like to briefly remind readers that we will be resuming the regular schedule for material beginning on Wednesday, March 27th. We apologize for the delay. Stay tuned. "And That's The Boxing Truth. Press Release: March 14, 2019 By Dragon Fire Boxing – Tanzania's Bruno Vifuavili pulled off what many saw as a massive upset last Friday evening, as he overcame the challenge of the experienced Joel Brunker. Brunker was the heavy favourite going into their IBF Pan Pacific Super Featherweight title fight at the Windsor Function Centre, but Wifuavili pulled off the shock upset, as he controlled the fight from the offset, and many neutral observers saw Wifuavili as the clear winner. 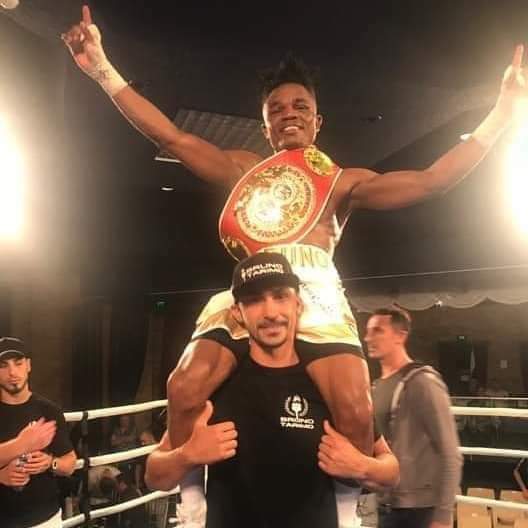 The judges agreed as Vifuavili, who was awarded the unanimous decision victory, joined an elite class that includes former IBF World Champion Lee Selby and current IBF World Champion Josh Warrington. The Tony Tolj guided Vifuavili opened up on his feelings at beating the highly rated Brunker and what this means for his career going forward. The Tanzanian native said, "Winning this title was a dream come true for me, but let me know it is just the start of a special journey. Manager Tony Tolj opened up on his charges Vifualivi options now going forward and reflects on his excellent performance. Tolj continued, outlining his plans for Vifualivi going forward, “Bruno is in his early twenties and after that performance, he should enter the IBF ratings. We want to fight the best and if anybody who is rated above us in the ratings wants the fight, we will take it with open arms. 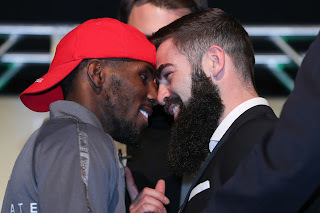 Press Release: By DAZN/Matchroom Boxing USA – PHILADELPHIA, March 13, 2019 – Two days before an exciting night of boxing at the Liacouras Center at Temple University, the media gathered for the official press conference of a stacked card headlined by IBF World Super Featherweight Titlist Tevin Farmer defending his belt in his hometown against undefeated Jono Carroll of Ireland. The action-packed event will also feature IBF & WBA World Female Lightweight Titlist Katie Taylor in a unification bout against the WBO World Female Lightweight Titlist Rose Volante, Philly’s Gabriel Rosado will go up against Maciej Sulecki in a middleweight tilt, and two Philadelphia natives, Hank Lundy and Avery Sparrow, will face off in a lightweight bout in front of their hometown crowd. The fighters took the stage to discuss their preparation and predictions before entering the ring on Friday night, live on DAZN. Friday’s event will be broadcasted live on DAZN with coverage beginning at 7 p.m. ET and main card starting at 9 p.m. ET. 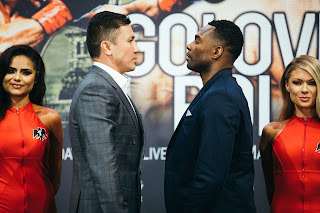 Material Courtesy of: DAZN/Matchroom Boxing USA/ Photo Courtesy of: Ed Mulholland/ Matchroom Boxing USA Used with permission. We would like to let our readers know that we are between rounds and will resume our regular schedule on Wednesday, March 27th. Stay tuned. "And That's The Boxing Truth." 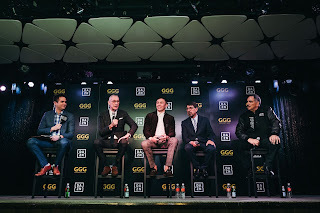 Press Release: LOS ANGELES, March 11, 2019 – The boxing media gathered on Monday afternoon at The Conga Room at LA Live to formally announce that Gennady ‘GGG” Golovkin will fight the rest of his career on DAZN, the world’s largest sports streaming platform. 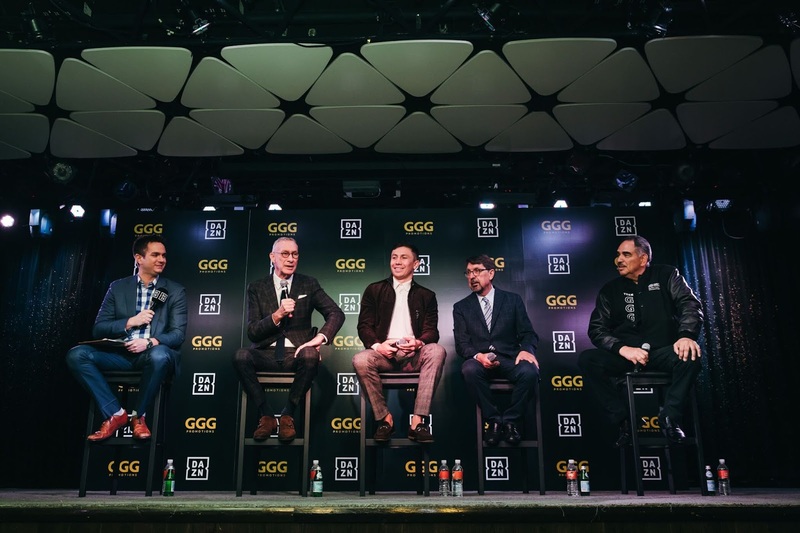 DAZN Executive Chairman John Skipper and former unified middleweight champion discussed the six-fight global partnership between GGG promotions and DAZN that will see Gennady ‘GGG’ Golovkin fight twice a year on the platform for the next three years. DAZN broadcaster Chris Mannix moderated the conversation. Material Courtesy of: DAZN/ Photo Courtesy of Amanda Westcott/DAZN USA Used with permission. 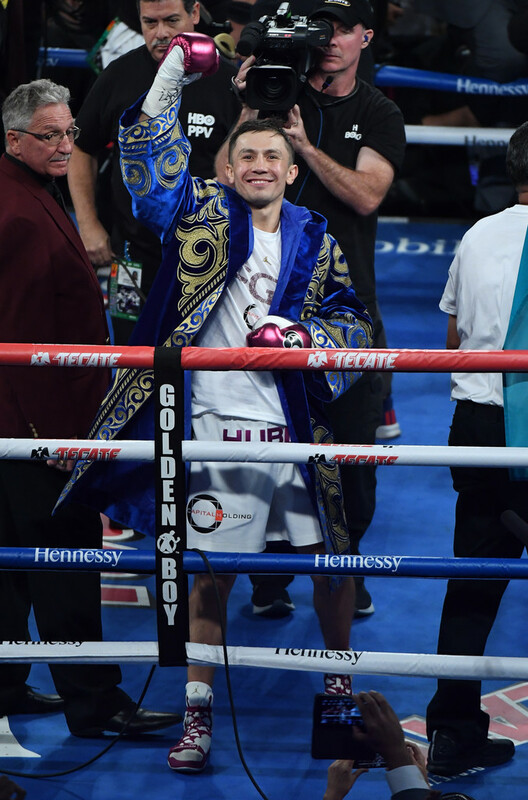 Press Release: By DAZN – NEW YORK, March 8, 2019 – DAZN Group Executive Chairman John Skipper announced today that Gennady “GGG” Golovkin will fight the rest of his career on DAZN, the world’s largest sports streaming platform. Material and photo courtesy of: DAZN Used with permission. In recent times the 175lb. Light-Heavyweight division has seen some shakeups. First was what some viewed as an upset in August of last year when unbeaten top contender Eleider Alvarez scored an impressive, but unexpected knockout over WBO world champion Sergey Kovalev. Alvarez’ victory was seen by some to be the beginning of a new era for the Light-Heavyweight division. An era that had been dominated in large part by two men, Kovalev, who Alvarez had defeated to become a world champion and Adonis Stevenson, the longtime holder of the WBC world championship in the division. Stevenson’s career was halted when he was knocked out in the eleventh round of his title defense against undefeated top contender Olekandr Gvozdyk in December of last year. A knockout that resulted in Stevenson suffering the effects of traumatic brain injury, effectively ending his career. While Stevenson continues to recover from injuries he sustained in that fight, the Light-Heavyweight division has moved on. As most Boxing fans know, Sergey Kovalev recently became a three-time Light-Heavyweight world champion by scoring a lopsided twelve round unanimous decision over Alvarez in February in their highly anticipated rematch. A fighter whom was sort of lost in the shuffle of the recent events of the division is undefeated WBA world champion Dmitry Bivol. Bivol first became WBA champion in October 2017 when he was named champion following the retirement of former unified Light-Heavyweight world champion Andre Ward. While Bivol’s ascent to become WBA world champion was one that began via initially earning interim/regular champion status in the World Boxing Association’s (WBA) Light-Heavyweight rankings, he has successfully defended his championship three times since being named champion including successful title defenses over longtime top contender Isaac Chilemba and former WBC world champion Jean Pascal in his last two fights. Bivol has developed a reputation as a knockout artist having scored knockouts in eleven of his fifteen professional fights registering a career knockout percentage of 73%. Prior to Sergey Kovalev’s loss last year to Eleider Alvarez, it appeared as though a potential encounter between Kovalev and Bivol might have been in the works. Both fighters were featured regularly on HBO here in the United States and had in fact competed on the same card where Kovalev lost Alvarez. While the landscape in terms of how the sport is broadcast has changed significantly over the last year with HBO no longer being involved in the sport, and Kovalev now seemingly aligned with ESPN, the potential of a showdown between Bivol and Kovalev seems unlikely at least in terms of the near future. With Sergey Kovalev aligned or so it would seem with ESPN, Bivol will return to the ring for his fifth title defense on Saturday night when he faces current WBA number eight rated contender Joe Smith Jr. at the Turning Stone Resort and Casino in Verona, NY in a bout that will headline a card broadcast by digital streaming network DAZN in what is the first of a multi-fight agreement between Bivol and the streaming platform. As is the case when discussing a fighter who is known as a “Knockout Artist”, the natural question is always who might be able to provide that fighter with a stern test. 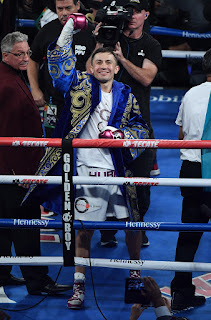 It is a topic that should be not be new to longtime readers here at The Boxing Truth® as it was a focal point in numerous writings penned by yours truly discussing the careers of both Sergey Kovalev and Gennady Golovkin over the years. While it is certainly tempting to place Bivol in the same category as Kovalev and Golovkin in terms of being a fighter who can score quick knockouts, the twenty-eight year-old Bivol has also shown the ability to be a technical boxer in his career. In Joe Smith Jr. Bivol will face a solid contender who has only been defeated in two of his twenty-six professional fights. Smith’s biggest victory thus far was when he knocked out future Hall of Famer Bernard Hopkins in December 2016 in the fifty-one-year-old Hopkins’ final fight in a legendary twenty-eight year career. Despite becoming the only man ever to stop Hopkins inside the distance, Smith was unable to take advantage of the notoriety that the victory provided him as he would lose his next fight to top contender Sullivan Barrera in July 2017. A fight where despite scoring a knockdown of Barrera in the first round, Smith came out on the losing end of a ten round unanimous decision. Smith will however, come into the fight off of a victory in his last fight as he scored a first round knockout over relative unknown Light-Heavyweight Melvin Russell in June of last year. The challenger, who hails from Long Island, NY has scored knockouts in twenty of his twenty-four career wins registering a career knockout percentage of 77%, which should indicate that he will likely not be intimidated by what Bivol brings to the table as he has also shown that he is capable of both out boxing an opponent as well as scoring a quick knockout should the opportunity arise as he notably did in his fight against longtime top contender and former world title challenger Andrzej Fonfara in June 2016, stopping the always “Game” Fonfara in the first round. In terms of a common opponent that Bivol and Smith share, the champion has the advantage as he stopped Sullivan Barrera in twelve rounds in March of last year. This fight appears to be one that will be decided on which fighter can dictate the combat. While the topic of who can dictate the tempo of a fight is one that is seemingly always discussed prior to a bout, in this case it does have merit. In an encounter between two fighters that each have the ability to box as well as get an opponent out of there if the opportunity presents itself, the question of who can dictate is crucial. For the challenger to be successful in this fight, this observer feels that he must find a way to apply consistent pressure on Bivol. Smith must not be reckless in his approach and must be tactical in how he approaches the champion and how he attempts to pressure Bivol. One thing that we have not seen in Bivol’s fifteen previous professional fights is him being put into a situation where he is uncomfortable and be put in the role of not being the fighter that dictates how the fight is fought. It will be interesting to see if Smith can be the first fighter to provide the champion with this kind of test. If this is indeed Smith’s strategy come fight night, the champion will likely look to apply his own tactical approach in an attempt to offset what the challenger might attempt. Bivol is a fighter that may be known for his ability to score knockouts, but he is also a fighter that has excellent technique and could be comfortable being in the role of a counter puncher should it be required. While Smith is likely to have a significant portion of crowd support in his favor in this fight, it will not be who the crowd favors that will necessarily win this fight. While yours truly has long been on record in saying that he doesn’t give predictions, it would not surprise me to see periods in this fight that are very tactical as well as periods where both fighters chins are tested. Although it is tempting to discuss what may lie ahead for the winner of this fight, this observer simply wants to see what happens when Bivol and Smith square off on Saturday night. Bivol vs. Smith takes place on Saturday, March 9th at the Turning Stone Resort and Casino in Verona, NY. The fight as well as its full undercard can be seen on digital streaming network DAZN beginning at 7PM ET/4PM PT. To subscribe to DAZN, availability around the world, list of connected streaming devices, and to start your free 30-day trial please visit: www.DAZN.com. In the United Kingdom and Ireland the card can be seen on Sky Sports Main Event (Formerly Sky Sports 1) beginning at 2 AM (Sunday, March 10th local UK time.) For more information about Sky Sports, schedules, and availability year area please visit: www.skysports.com. 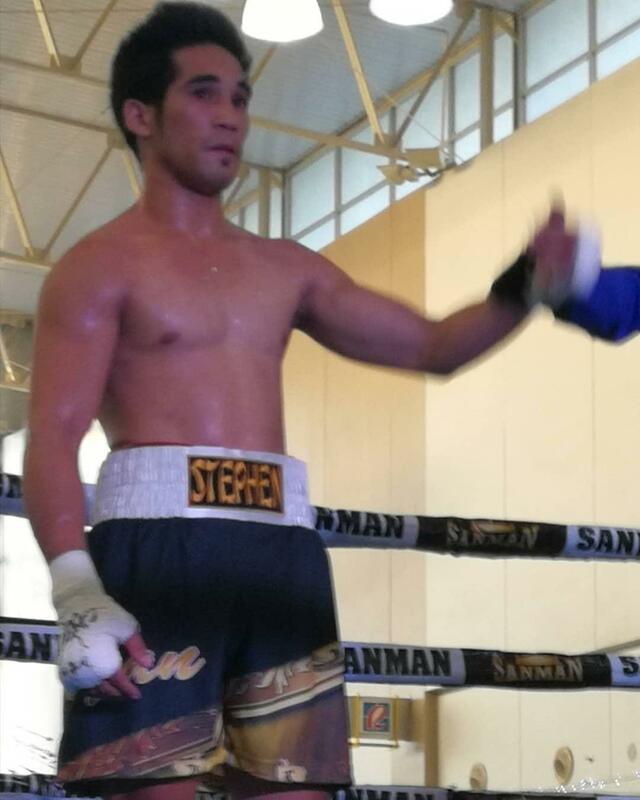 Press Release: March 6, 2019 by Sanman Promotions – Sanman’s fresh super bantamweight prospect Stephen Bontuyan (W5 KO2 L0 D0) upsets a more experienced then undefeated Jestine Tesoro in their eight rounder match in Tagum City. 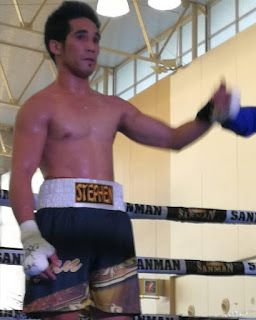 Bontuyan was consistently quick and accurate with his punches sending Tesoro to the canvass in the fifth stanza and dominating the rest of the round for the unanimous win. In the other bouts, another undefeated Sanman boxer Judy Flores (W7 KO4 L0 D0) stopped seasoned journeyman Jetly Purisima in the fourth round. The fight was in the super flyweight division. In the opening bout, flyweight Jegear Bereño came short of a victory and got a split draw against Arjay Recopelacion. Material and photo courtesy of: Sanman Promotions used with permission. For more information about Sanman Promotions and to watch the Sanman Live Boxing series please visit Sanman Promotions’ official Facebook page: www.facebook.com/SanmanPromotions. 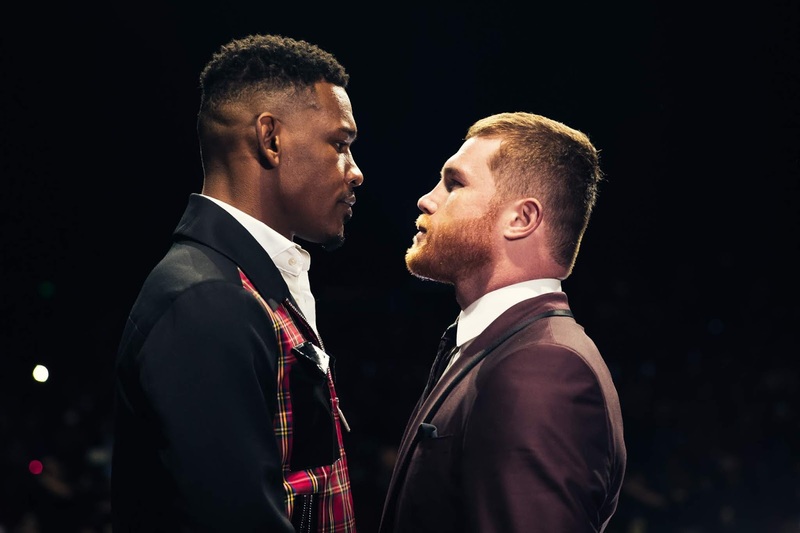 Press Release: By DAZN - LOS ANGELES (March 5, 2019): Canelo Alvarez (50-1-2, 34 KOs), WBC, WBA, Lineal and Ring Magazine Middleweight World Champion, and Daniel "Miracle Man" Jacobs (35-2, 29 KOs), IBF Middleweight World Champion, completed the final stop of their three-city press tour with a spectacular press event at Microsoft Theater at L.A. Live.The 12-round unification fight will take place at T-Mobile Arena in Las Vegas Saturday May 4 and will be streamed live exclusively on DAZN. "I know Jacobs is a tough opponent and it's going to be work, but I've always believed to be the best you must beat the best. I love challenges. I want people to experience a good fight when they come watch my fights. I may lose, but my heart is a winning heart and I want to give the fans a spectacular finish and I'm going to put up a good fight." "I have the will and desire to go inside to go in that ring and be victorious and I see myself with my hand raised by the end of night. I know the odds are stacked against me and Canelo's resume speaks for itself, but he's never faced a tall, fast and big guy all at once and that's what I'm going to give him. We're going to give you what you're looking for and the fans going to get a great fight come May 4." "Our objective this year is win all the belts and become the first Mexican to win the all the world championships." "The moment he set foot in the gym we knew he was something special, the day he debuted he was great, but the day he retires the world will know how great of a fighter he is." "Jacobs is the best middleweight walking on this planet, his capabilities, skillset and gentleman ship will be what wins the fight on May 4." "I guarantee this is going to be the fight of the year. You have two fighters who don't have a quit in their game, this is a fight for the ages. 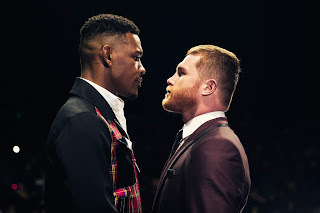 The fact that Jacobs and Canelo both want to be great, there's no other way than to make this one great for the fans, they will get their money's worth come May 4." "We believe Jacobs will unify all of those belts and he'll take on Canelo and win that fight." "We're deeply honored and proud to be exclusively showing this champion versus champion fight in the U.S."
"We are tremendously excited to bring the Canelo versus Jacobs fight to Las Vegas; it's going to be a great event." Follow on Instagram @GoldenBoyBoxing, @Canelo, @DanielJacobsTKO, @MatchroomBoxing and @DAZN_USA. Follow the conversation using #CaneloJacobs. Material Courtesy of DAZN/Photo Credit: Amanda Westcott/ DAZN USA Used with permission. To subscribe to DAZN, a list of connected streaming devices, availability internationally, schedules, and to start your free 30-day trial please visit: www.DAZN.com.